I expect a number of clergy did what I did on April 25: said the Litany privately after Lauds. And we have the Rogation Days coming up next week, inviting us again to revisit the Litany (is it very unreconstructed-Anglican to use the word in the singular, or should I papalise myself and always say "Litanies"?). But perhaps an overview would be useful. Perhaps I should make clear that I am referring to the Litany; what is sometimes called the Litany of the Saints. The use of the Litany is a plea for Divine Mercy (so should the Holy Father have mentioned the suitability of litanies during his Jubilee Year?). 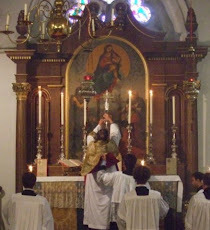 The texts of the Rogation Mass suggest that, rather like the Gesima Sundays, these days upon which the Litany has commonly been sung constitute a cry for help in times of affliction. But how often do we so use it? Might not the modern Catholic be more likely to turn to the Rosary? Corporately, might we offer somebody, like the Holy Father, a spiritual bouquet of Rosaries? Heaven knows, I have nothing against the Rosary. How could anyone? But the Litany is the great, majestic, formal supplication of the Western Church. Especially in times of trial. It is also used when we are engaged upon some great Action. Hence, truncated forms of the Litany will have been heard by most Catholics on Holy Saturday, as Holy Mother Church prepares to nurture a new Brood of neophytes. It will have been heard by many at Ordinations and Consecrations, as new clergy receive the Church's most solemn commission. Those who have watched papal inaugurations will have heard it. But it rarely gets a look-in outside these contexts. The spirit behind the use of the Litany as the solemn, stately, corporate Entreaty of an afflicted Church is particularly emphasised by its use at the Quarant' ore: the Forty Hours devotion before the most Holy Sacrament exposed. It is easy to think of this magnificent devotion as an expression of wonder at the Presence among us of our Eucharistic Lord, but this is not how the Church has seen it (what follows is plagiarised from an attractive little CTS booklet of 1949, edited by an Oratorian called Fr J R McKee). And the Quarant' ore includes, on its first and third (final) day, the solemn singing of the Litany before the Blessed Sacrament exposed. At various times and places, the Litany was accompanied by such penitential endeavours as fasting and abstinence; but not recently. The only relevant indulgence I can find in the Encheiridion is a partial one for anybody reciting any of the approved litanies (and, of course, those taking part in a Quarant' ore can acquire the plenary indulgences obtainable suetis condicionibus for spending half an hour in eucharistic adoration or taking part in a Eucharistic Procession). A rather ungenerous provision, don't you think, for which we can blame the post-conciliar cull (Pius XI had attached to the Litany a plenary indulgence semel in mense). The Hymnos Akathistos gets a plenary, and so it jolly well should; why not the Litany?? ..."a spiritual bouquet of Rosaries" for the Holy Father? Don't bother. It would not be appreciated.